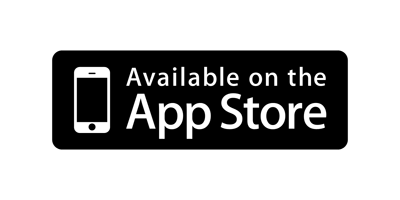 AudibleSpeed (GPS Speed Monitor) update - version 1.0.5 - now available in AppStore!! AudibleSpeed (GPS Speed Monitor) version 1.0.1 RELEASED in AppStore!! 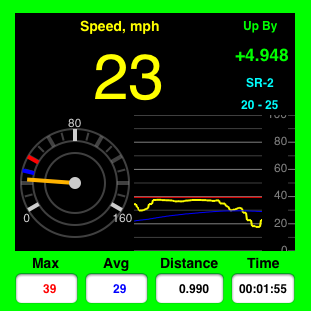 AudibleSpeed (GPS Speed Monitor) version 1.0.1 submitted to AppStore for review. This utility app allows you to define one or more Speed Ranges and associate each range with a sound effect and a color code (any RGB color). - it also tracks and displays the MAX and AVG speed for the session, as well as time and distance traveled. When the GPS satellites signal is unavailable (e.g., inside tunnels, between skyscrapers, under big bridges, indoors, etc) and/or GPS speed data becomes "stale" (older than 5 seconds) it will play a warning "beep" sound and flash the frame/background color black and white. - and then it will then create a set of sample speed ranges with values that best illustrate the concept taking into account the speed measurement units selected in Settings (you can later modify or delete these sample ranges - just as if they were your own created by you). Because this app uses the GPS unit to obtain speed data, it must be allowed to access "Location Services" when prompted to do so. Also "Location Services" must be turned "ON" and the "Airplane Mode" must be "OFF" in the iPhone's standard "Settings" page. Besides using the GPS data to determine current speed, this app is also retrieving and displaying your current Long, Lat and Alt, but it is NOT actually "tracking" your location as such - i.e. it does not store or report or make any use of Long/Lat/Alt data other than displaying on screen and calculating the distance between previous and current location point (to aggregate total distance traveled). It comes prepackaged with 90 thoughtfully hand-picked sound effects to choose from. Used FREE sound samples from freesound.org. *** This application is provided for informational and entertainment purposes only. The consumer-grade GPS technology (like the one found in iPhone 3G/3GS or any other GPS-enabled phones) has substantial inherent limitations regarding its availability, accuracy and reliability - especially in regards to speed data. Therefore it can not and MUST NOT be used for primary navigation. You should also check your local laws, rules and regulations regarding the use of mobile phones and other mobile devices while driving, and comply accordingly.